Take a lunch break with this cute insulated lunch tote with polka dot bow trim. Add personalization for back to school or work. Compact in size and lightweight. Perfect for lunch on the go. Includes embroidered name, single or three letter monogram. 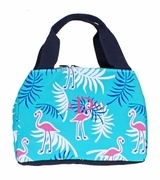 Personalized lunch tote measures 7�H x 12�W x 5 inches across the bottom. Zipper closure with outside open pocket. Bought as a gift. Very impressed with quality and I received it so quickly! Looks just like the picture only better! I might buy one for myself, can't beat the price! The lunch bag was a gift...my friend loved it & so did I...Also I like that customer service called when something wasn't right..they corrected it and shipped bag out as advertised..will order from again. Finally a real lunch bag!! Love the bag! It is bright pink and very cute, done just the way I wanted it. Shipping was quicker than expected too! I will get more stuff soon, good/reputable site ? I love the quality of the bag, the assortment of colors and bows! I was also impressed with how fast I received it! I cannot wait to use it for my new job! I look forward to ordering more!!! Got this for my daughter's teacher for teacher appreciation week. She is getting married so I was able to put her new name on there. I like that they did the embroidery where you can still use the pocket. I have the SAME lunch box from another site and they embroidered the pocket closed and messed up the insulating material on the inside. Simply bags DOES NOT do that and I really appreciate that!!!! I have ordered eight bags for my staff for Administrative Professionals Day. The bags are really cute. I know my staff will love them! Bought this for a Christmas present. Haven't given it yet but im impressed by quality for price and how quickly I received it!!! !